You will then be presented with the participants popup window. From your Class Lists on the left hand side, you can add a whole class by simply clicking on eat “Add” button. When a class has been added, the participants will show on the right hand side. You can also add participants manually by entering the email address in the top left of this window (below we have manually added student@class.com) Click on “Add Student” and they will be added to the session too. 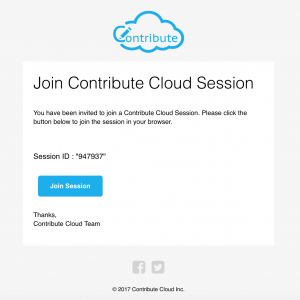 When you have added all the students that you wish for the session, you can then send them an email invitation by clicking on the “send invitation” button. An email will be sent instantly to their inbox. The invitation email looks like the email below and you will see there is a large “join” button. The students simply click on the button and the will open a browser on their device and join the session.